Youth from 19 counties around Texas left Prairie View A&M University much more knowledgeable about science, technology, engineering, agriculture and mathematics (STEAM) June 17 after spending three days of hands-on learning during the Cooperative Extension Program’s 2010 4-H Career Awareness and Youth leadership Lab. Workshops were designed to not only stimulate the students’ interest, but also to educate them on how to be successful in society economically, nutritionally, as well as creatively. During the “Express Yourself” workshop, which allowed students to create and produce their own magazine including self taken photographs and their personal accounts of the Youth Lab, participant Jackie Reese discussed what she learned in the “Grown and On Your Own” workshop. Jakayla Debera, left, of Washington County and Kyanna Washington study DNA technology in the Youth Lab's "DNA 411" session. 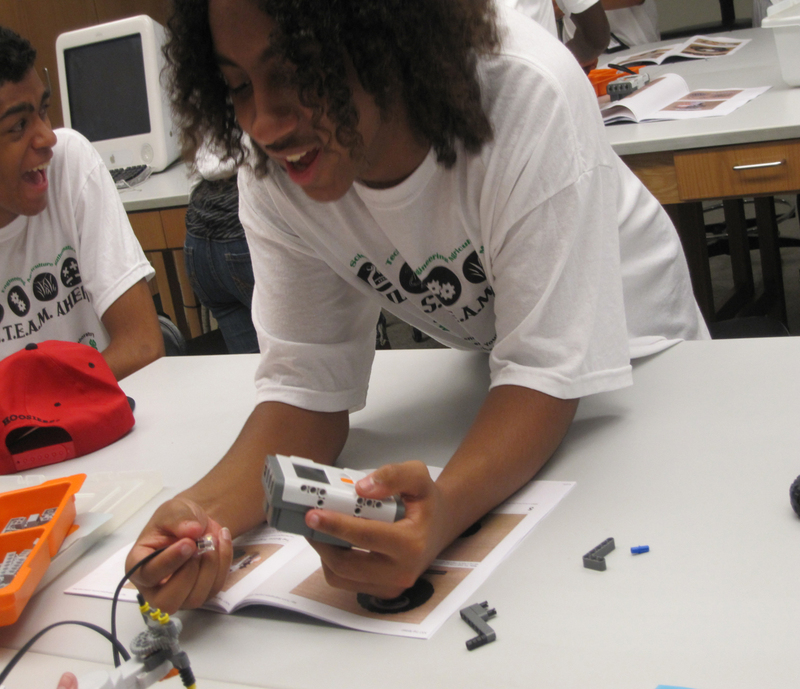 Josh Beasley, left, and DJ Johnson of Dallas County learn a lot about robotics at the CEP 2010 Youth Lab. 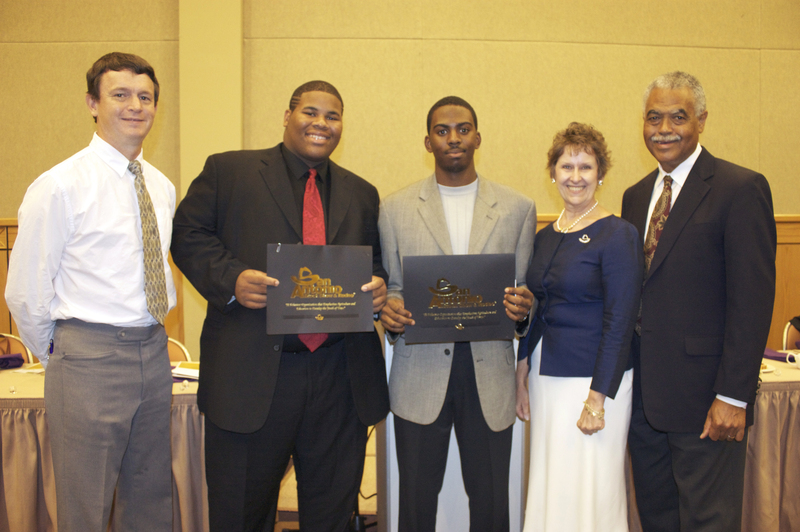 In addition to the workshops, the youth led the general sessions and had the chance to hear a motivational talk from Keith Davis, a 19 year old entrepreneur, and Frank Jackson, mayor of the city of Prairie View and the university’s governmental affairs officer, who gave them a detailed history of Prairie View A&M University and how it grew into a major institution of learning for mainly African-Americans in the early years, who were limited on where they could attend college in Texas. The Lab concluded with an awards luncheon where Andre Johnson, president and CEO of Speaking Muscles Academy and Institute was keynote speaker. Johnson encouraged students to discover and identify their DNA or dynamic natural ability, because it will position them to dominate their industry or career field. “Greatness lies from within,” said Johnson. Johnson emphasized that things will not always be easy, and that success comes from doing things not always desired. He told students to strive for three R’s when becoming successful. Johnson said reputation, reliability and relationships are essential. Pictured left to right are Scott Horner, extension research specialist, S.A.L.E. scholarship award winners, Keith Hamilton and Conlee Fry, Scereta Rodriguez--S.A.L.E. scholarship coordinator, and Dr. Freddie L. Richards, Sr., dean, College of Agriculture and Human Sciences and administrator, Cooperative Extension Program. At the luncheon students were also awarded for their academic achievement. Scereta Rodriguez, scholarship coordinator of the San Antonio Livestock Exposition (S.A.L.E) presented Keith Hamilton, San Antonio, Texas, Samuel Clemens High School in Bexar County and Conlee Fry, Hockley, Texas, Waller High School in Waller County, scholarships in the amount of $15,000. Both of them will attend Prairie View A&M University in the fall. Volunteer leaders, who accompanied the CEP county staff and students to the Lab and are very instrumental in identifying these young people that attend the 4-H events, were awarded certificates for their hard work and diligence. “We are always appreciative of our volunteer leaders and the work that they do to strengthen our county programs,” said Dr. Freddie L. Richards, Sr., dean, College of Agriculture and Human Sciences and administrator, Cooperative Extension Program. Dr. Richards recognized several individuals who brought greetings to the youth at the awards luncheon including Dr. Felecia M. Nave, associate provost and associate vice-president for Academic Affairs, Prairie View A&M University, Chelsee Hill, Miss PVAMU, 2009-2010 and Dr. Mark Poth, research director – Competitive Programs, USDA-National Institute of Food and Agriculture. For more information about the Career Awareness & Youth Leadership Laboratory, contact Gail Long at 936/261-5119, glong@ag.tamu.edu or visit pvcep.pvamu.edu. This entry was posted on Wednesday, June 23rd, 2010 at 9:48 pm and is filed under 4-H & Youth Development. You can follow any responses to this entry through the RSS 2.0 feed. You can leave a response, or trackback from your own site.